Today we'll conclude the busiest week yet of the 2018 legislative session. Counting today, seven of the past eight days (including Saturday morning) have been dedicated to “floor action.” That means being on the floor of the Senate chamber, taking action on bills. It lasted well into the night more than once, with the longest stretch of floor voting taking us far past midnight. Our break was on Sunday. Once this first round of floor action is behind us (and also for my colleagues in the House), we will be at a significant point in the session. Except for bills that will be part of an eventual budget package, every piece of legislation still in play will have been passed by either the Senate or House – meaning it’s already halfway through the lawmaking process. Floor voting is a particularly busy time for me, as the assistant floor leader for our side of the aisle. Although the Senate floor debates may appear fairly seamless to folks viewing back home on TVW, a lot of coordination is involved. Tracking bills and amendments, offering amendments at the correct time, knowing who will offer an amendment and speak in support of it – those are just several examples of the many moving parts that a debate can include. The second and final period of floor voting is March 3-8, to conclude the session. After today my Senate colleagues and I will turn our focus back to committee hearings, this time on bills that have come over from the House. The House committees will do the same with many Senate bills. 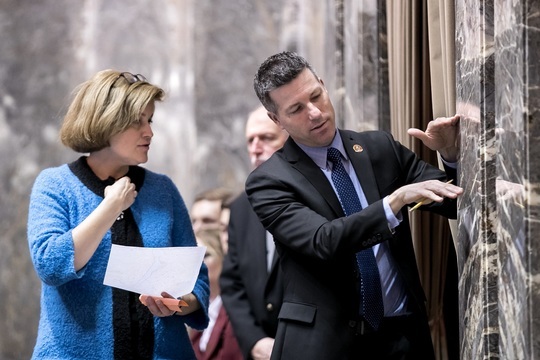 During a pause in voting yesterday, Senator Christine Rolfes (D-Bainbridge Island) and I discuss a funding issue affecting local school districts. Senator Rolfes chairs the Senate Ways and Means Committee and serves as the lead budget developer. Some bills passed by the Senate have already received attention from House committees. My Senate Bill 6211, to support the Department of Natural Resources’ Good Neighbor work agreements, was endorsed February 9 by the House committee on natural resources. It had received unanimous Senate approval on January 24. My Senate Bill 6055, to help Leavenworth address an unusual situation involving the disposal of brush and yard waste, received unanimous support from the Senate yesterday. I expect to see it routed to the House Environment Committee. That’s because the Senate’s Energy, Environment and Technology Committee had jurisdiction of the bill in the Senate. The first of the state’s quarterly revenue forecasts for this year will be made public tomorrow morning. My Senate and House colleagues developing the operating budget will use the forecast to propose mid-course adjustments to the two-year budget adopted last year. Those adjustments are collected in what’s called the “supplemental” operating budget. Soon we will see the respective supplemental budget proposals begin their journey through the lawmaking process, along with measures considered to be part of the larger budget package. Work is also under way on a supplemental capital budget and a supplemental transportation budget. I have been advocating for projects related to each – the cleanup of Saddle Rock soil being an example. Click here for my recent interview on KOHO Radio that goes into more detail about what’s ahead.